You can’t just stop buying food when your budget gets tight, but you can always find ways to rein in your spending on groceries. Here are a few tricks along those lines. Although so-called extreme couponing gets treated almost like a pathology on television, get on the right side of this one. As much as $57 billion in coupons go unused every year, and whatever others skip can be your gain. ShopAtHome lets you earn rebates and discounts. As long as you’re making a hobby out of extreme couponing, you might as well sign up for as many of these savings apps as possible to maximize your savings. Although most online grocery applications and websites charge a monthly fee for deliveries, a number of them offer free deliveries with a qualifying purchase. Try to steer clear of the ones that require minimum purchase sizes since they tend to make people buy more than they otherwise would. Instead, look for retailers that let you order online and pick up at the store. Another benefit of shopping online is the ease of knowing how much you’ve got in your shopping cart. Plus you might find it easier to put things back if you don’t have to face a human cashier. Your ability to make smart food shopping choices grows exponentially when you resolve never to shop on an empty stomach. Of course, many people let this go out the window by waiting until the cupboard is completely bare before they go shopping. Although some might argue that this keeps them from buying more than they need, you do more of that when you’re hungry than when you’re full. Or when you’re emotional, for that matter — save the grocery shopping for when you’re in a good mood. That will help you see whether you’re buying things you need instead of buying things you simply want. Although prepackaged or frozen foods can save time, they cost several times more than their counterparts that aren’t all dressed up. If you’re concerned about saving time during the week, cook a bunch of things over the weekend and portion them out into single servings that you can reheat any time — or take to the office, if need be. 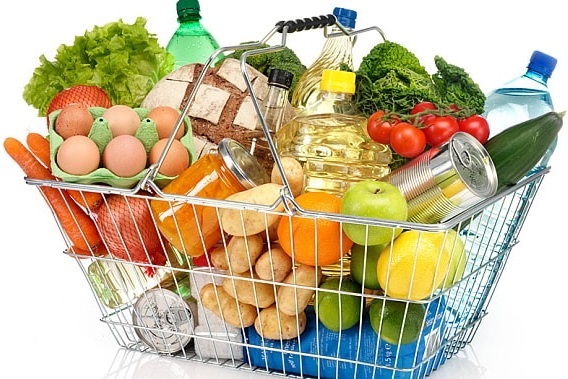 Readers, what tricks do you use to try to cut back on grocery spending?